Etching by Jacques Androuet Du Cerceau?, 26.2 x 14.5 (Herbet). Le Blanc, 1854-1890, I, 45, 21, as 26.2? x 14.5?, and as Du Cerceau after Rosso. Herbet, IV, 1900, 309 (1969, 159), 4, as Du Cerceau after Rosso. COLLECTION: Paris, Bd 19, Vol. I (Primatice), fol. 57, the upper right corner missing, holes at the left edge, on torso, at lower left, and at lower right; inscribed in ink with a number in the lower left corner, perhaps: 466. Mariette, Abécédario, 1858-1859, 19-20, as would seem to be by P. de Jode after Rosso, not after Annibale Carracci as has been written; Mariette said the same figure can be found in a cartouche by Rosso [which I do not know]. Geymüller, 1887, 323, as Du Cerceau after Rosso. Kusenberg, 1931, 169, as Du Cerceau not after Rosso but by the same artist who designed the Apollo Slaying the Niobids (Bartsch, XVI, 425-426, 125, and Herbet, IV, 1900, 309, 3, as Du Cerceau after Primaticcio). Carroll, 1987, 334, n. 1, under no. 104, may have wrongly identified this etching with the engraving [E.151] of the same composition, depending on which print is related to the earlier citations. Boorsch, 1988, 9, Fig. 6, as after Rosso. 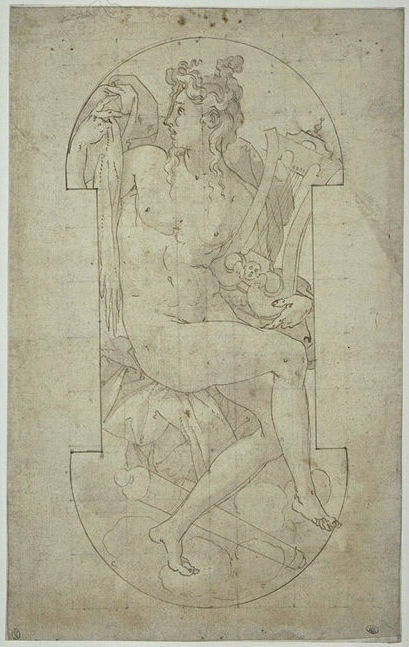 This print is related to, but not based on, Rosso’s drawing in the Louvre (Fig.D.76Aa), which seems to have been made for his lost decoration of the Salle Haute in the Pavillon des Poêles at Fontainebleau (L.43). The print is in the same direction as the drawing. In the print, the indentations at the sides of the area containing the figure appear as in the drawing although farther apart so that the area containing the figure is slightly broader in the etching. However, there is no indication in the etching of the half-circle shape of this area at the top and bottom as appears in Rosso’s drawing. It would seem that this etching, with its somewhat different and finer details and in general more finished appearance, is based on a later lost drawing by Rosso for the same project (as distinct from the engraving, E.151, which is based on Rosso’s surviving drawing). The largest change is the transformation of the ornamental drapery behind Apollo upon which he sits into what is more obviously a cloak that he lifts with his right hand and that falls over his left shoulder and around his left arm. Where in Rosso’s drawing his right hand holds up the skin of one of Marsyas’s arms, in the etching this hand is meant to appear to be holding up his cloak as though to look beyond it. Marsyas’s skin has become a length of fur somehow attached to his cloak, another smaller length of fur appearing at his left wrist. The passage of drapery on which Apollo sits has now a scalloped edge. 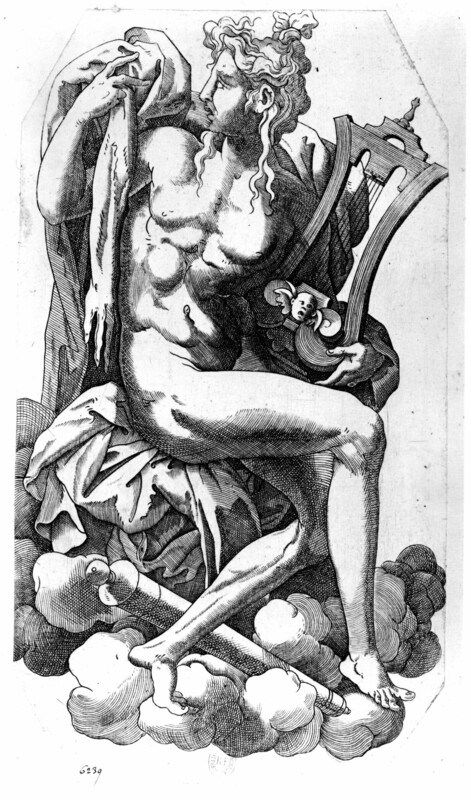 Furthermore, in the etching, Apollo’s torso has become more muscular, the ornamental head on the harp has been moved to the top of the instrument and appears realistic, and the quiver is decoratively elaborated at both ends. 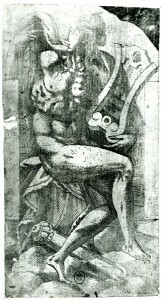 More significantly, Apollo’s expression has become pleasant, losing the perplexity on his face in Rosso’s drawing and in the anonymous engraving made from it (Fig.E.151). 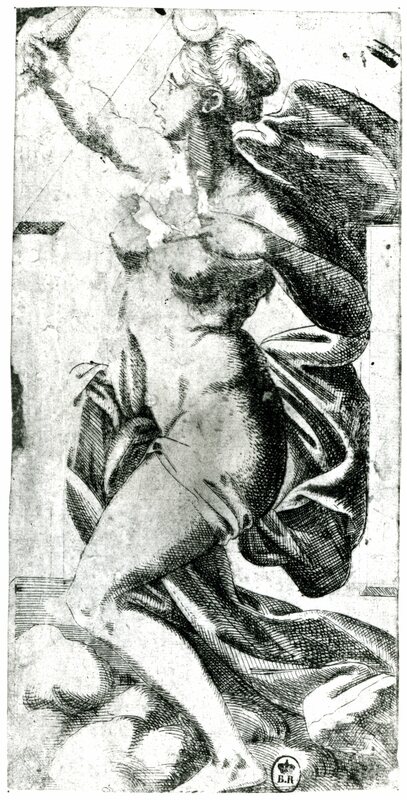 Stylistically, the Apollo etching is closely related to Rosso’s Diana Shooting with Her Bow, known from another print by the same etcher (Fig.E.61). It is not certain that this etcher is Du Cerceau. See E.151, Anonymous, Apollo Holding a Lyre, also probably related to the decoration of the Salle Haute. See E.152, Anonymous, Venus and Cupid, also probably related to the decoration of the Salle Haute.